I have an area above our shelves that we will hang and display all of the bits and pieces we make in the lead up to St Patrick's Day. I have plans to do an Irish Flag Garland, Shamrock Garland and Window Blings. Various Rainbow crafts, Pots of Gold and whatever else I can come up with over the next few days. So I thought a little Wall Poster was in order to hang in that area also. B has been doing more of a Notebooking style when it comes to 'work output' (this we will keep and compile). So all of his work is pretty much done on A4 sheets and I was thinking that at the end of the year I may possibly bind it all into a book (depending on how much there is) as a record/momento of the year. In his first two years of shcool we did lapbooks, quite a few lapbooks (most of which I still haven't shared here) and K will start doing lapbooks as well. 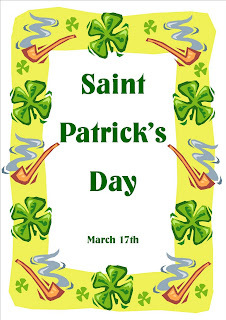 I hope to be able to use the printables I am working on now for St Paddy's Day for both B's Notebook Pages and K's Lapbooks. 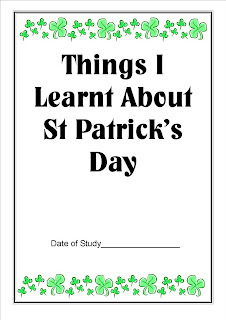 along with our Mini Study of St Patrick's Day. They can either go on the front of a lapbook or at the start of the notebooking pages, whichever you choose. we are all finished with the unit.